The discipline of Mevlevi Order was established by Mevlevi’s son Sultan Veled, his disciple Chalabi Husameddin, and his grandson Ulu Arif Chalabi in order to pass on his teachings to future generations. Ever since then, the “order” has been presided over by a Makam Chalabi (Chief Master) elected from among Mevlana’s offspring. The Mausoleum and the Mevlevihane are both regarded as “cult” by Mevlevi followers. This initial “House”, located around the Mausoleum, has been named Asitane-i Aliyye, where “Makam” Chalabis (chief masters) have dwelled. The Mevlevihanes have been divided into two kinds: “Asitanes, which are authorized to give education for up to a 1001 days and secondly, Zaviyes”, which are relatively smaller and have no network for education. The former kind was more central, systematic, and better organized. Dedes could only be educated here and the architectural structure called Matbah-i Sherif, where the period of sufferance for a 1001 days was finalised. The postnishins in Asitanes held a higher status than those in Zaviyes. Zaviyes were founded in many cities and even in the villages of the Ottoman Empire. Up to the 17th century Zaviyes spread in accordance with the expanding boundaries of the Empire and were, therefore, able to educate wider circles. There were approximately 140 Mevlevihanes within the boundaries of the Empire. 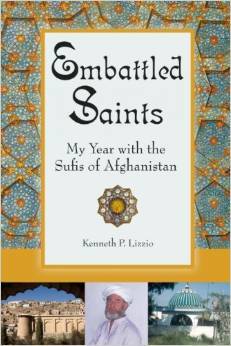 The education in Islamic Mysticism was a harder task than the Medrese (theological university) education. This spiritual journey, called Seyru Seluk, also had to include “self-discipline”. Whosoever wished to enter this order of education was obliged to have parental permission, hold his majority, and be unmarried. The candidate, having been approved as bearing the appropriate character traits, was then informed of the difficulties along the path he was about to take. Upon his persistence, he would be seated at the place known as Saka Postu in the Matbah-i Sherif (kitchen) for theree days, observing the way of life in the House of Order. He was given food and water, but no one spoke to him so as to avoid any influence. In the case of a change of heart owing to mismatch on his part, he could leave without a word. However, if he decided to stay he would be led to Sheikh Efendi by the Ascı Dede (Chief of Kitchen). Consequently he would be admitted into the order (discipline) at a Sikke (Mevlevi ritual hat) decoration ritual and then submitted to a “dede” for further training. Nevertheless, he would still be granted an 18 day trial period, during which he was to serve in his own garments. Nev-niyaz (a newly accepted apprentice) would stay in the Mevlevihane throughout the course of his a 1001 day training period. In the meantime he was to run errands in 18 different chores, each checked by a different dede. These included the following: dish-washing to bed-making; table-service to house-cleaning; washing laundry to shopping; and finally to bathroom hygene, all of which were prerequisites of “self -discipline” training. 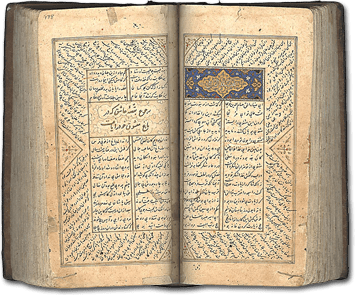 Additionally to this intensive soul-training program, he would also receive fundamental schooling in literacy; adequate Arabic to enable him to read and comprehend the Quran, hadiths (prophets utterances), and fıkıh (knowledge of Islam); as well as adequate Persian and Turkish literature to enable him to read Masnawi. Also in accordance with his personal skills and aptitude, he could learn to play an instrument and/or sing in the rituals. He would often be encouraged to acquire an artistic skill such as hat, tezhip, or miniature. Having completed the 1001 day training period, Can (fellow soul) would be granted the title of “Dede” at a special ceremony. Subsequent to his decoration, he would either be given a “cell” in that Mevlevihane or transferred to another Mevlevihane. In Mevlevihanes, there would be outside followers attending lessons, learning the Sema ceremony, or merely sitting in the audience. In summary, Mevlevihanes have always served as sort of conservatories or art academies, while giving education on Hz. Mevlana’s teachings along with theology and literature. Namely the Mevlevihanes in Istanbul have played a significant role in training master performers of Turkish Music. Even though in the course of history the above defined education has obviously suited male students better, there have also been female dervishes (whirling members of the House), who held the position of postnishin, professor, and caliph, or some who acted on behalf of their underage sons. As it is revealed by Eflaki in his book, The Hisory of Mevlevis, at the request of Ulu Arif Chalabi, Sefer Hatun (Sultan Veled’s daughter) enlightened many students, male and female alike; while Arif-i Hoslika, a Mevlevi caliph, taught in Tokat. Also, in Afyon, Destina Hatun, one of Divane Mehmet Chalabi’s grandchildren, was an authority in the Mevlevihane appearing in her Mevlevi garments and her sikke (Mevlevi hat). Later on, also in Afyonkarahisar, Kucuk Meahmed Chalabi’s elder daughter Gunes Han held the positions of sheikh and caliph. Another lady who served as sheikh was Gunes Han-ı Sugra, Kucuk Arif Chalabi’s daughter. Despite the changing conditions in the nation, female Mevlevis were licensed to wear “arakiyye” and “sikke”. They were even trained for the Sema, but they performed among themselves. The Mevlevi life is based on “adab and erkan” (discipline and rules of conduct). In their conduct, they are very kind, graceful, and discreet and they never go to extremes in behaviour or in speech. In salute, they place their right hand on their heart and incline their head slightly, implying “you are in my heart”. Even their handshake is peculiar to their discipline. They seize and kiss the back of each others hands, indicating mutual respect and equality. This is a greeting from ”soul to soul” and denotes equality of existence. 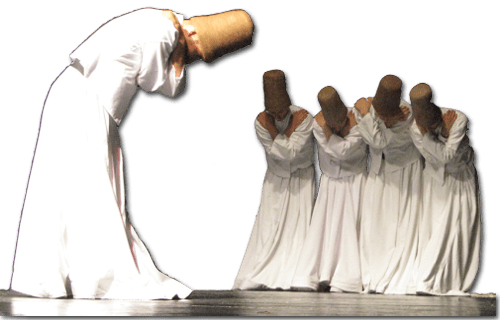 Every part of the Mevlevi system of behavior bears a symbolical meaning, such as taking soft steps or showing respect to their daily appliances, and they can be observed in the act of the whirling dervishes in ‘Sema’ rituals, which are considered an extension of their daily lives. The Sema came to symbolize Mevlevi Order for it is the oldest ritual of the Order. Accompanied by music and systemized by certain rules, the “whirling” act has, in time, become more majestic, impressive, and appealing. Pir Adil Chalabi (died 1490), one of Hz. Mevlana’s great-grandchildren, more or less finalized the form, as performed today, of “Sema”. In time it was transformed into a ‘ritual’ by Mevlevis. Each act in this ritual bears a meaning and is carried out in grace. 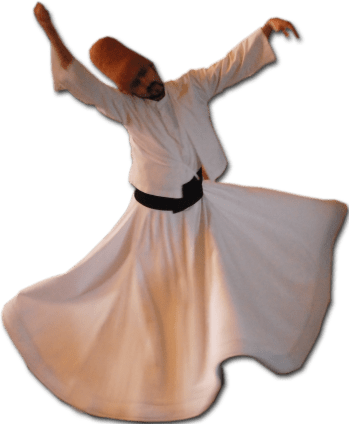 From the dervish’s garments to each of his movements, and from the particular shape of the Mevlevihane to the colours of the “post”, all is symbolic. For instance, the Semahane (Ritual Quarters) has a round floor to represent the universe; the colour red of the post on which the Sheikh sits is regarded as Hz. Mevlana Celaleddin-i Rumi’s abode, occupied by the Sheikh Efendi on his behalf. The colour red symbolizes ¨unity with God¨; Hz. Mevlana united with his Allah at sunset. When the sun is rising and setting the sky turns red. The red colour of the Sheikh post similarly indicates “departing life on Earth” and rising into the spiritual life. The post, beginners of Mawlavi Order sit, is black. In his “journey of enlightenment” the new initiate comes to earn a white “post”. As for the Semazen’s garments, his “sikke”, shaped like a tombstone, symbolizes the tombstone of his ego; his “tennure” (overcoat), the shroud of his ego; and his waistcoat, his ego itself. As the Semazen begins the whirling ritual, he takes off his waistcoat. This indicates Semazen’s stepping into purification. His arms crossed on his chest represent God’s uniqueness. Opening both arms to the sides and revolving from right to left, he emerges as embracing the entire universe. His right hand with the open palm extended upwards indicates reception from God, passage through the heart’s path. His left hand with the palm extended downwards indicates fair distribution among fellow men. At this point, there is also emphasis on the dervish’s dissolving into divine existence. Today, a “Sema” begins with “Nat-ı Sherif”, music in praise of our prophet Hz. Mohammad, as composed by Mustafa Itri Efendi (died 1712). The sound of “kudum” recalls God’s command, “Be!” while creating the cosmos. This is followed by “ney”, the divine breath! The Universe has been composed and life has begun. Semazens, as led by “Sheikh Efendi”, follow a circular path around the Semahane. Each semi-circle symbolizes the material world while the other half stands for the spiritual worlds. The completion of these three acts called “Devr-i Veledi” implies an initial orientation for a spiritual journey. Taking off his upper-most garment, the Semazen begins revolving as he is granted permission by his Sheikh. As the Sema concludes, both the dervish and the audience feel closer to the Almighty Creator. Their love for him strengthened, and their souls purified, they attain a contented and peaceful state of mind. Our legacy of Mevlana comprises a significant portion of our culture, therefore, not only must we claim him, but we must also study and digest his knowledge and transfer our acquisition appropriately and most truthfully to future generations. My great-grandfather, Abdulhalim Chalabi, who served as “Makam Chalabi” during the War of Independence, was decorated with a green-ribbon “İstiklal” medal for his spiritual support. At the first House of Representatives, Gazi Mustafa Kemal (Ataturk) was elected President and Abdulhalim Chalabi, representative of Konya was elected Vice-President. Upon the termination of the First House of Representatives, as the mission was fulfilled, Abdulhalim Chalabi requested permission to return to Konya. As the Law of “Tekke and Zaviye” was passed, following his meeting with Ataturk, Abdulhalim Chalabi appointed his son, Mehmed Bakır Chalabi as the Sheikh of the Mevlevihane in Damascus, Syria. The incumbent “Makam Chalabi” was renowned for his authentic activity both during the Declaration of Independence of Hatay (1938), and her Annexation the following year. Upon his death in 1944, his son Celaleddin Bakir Chalabi (1926-1996) was appointed the “Makam Chalabi” with the consensus of the Sheikhs of Damascus, Lazkiye, Tripoli, Cairo, and Cyprus. Due to the fact that Celaleddin Bakir Chalabi’s education was not yet completed, his uncle Semsu’l-Vahid Chalabi (1908-1971), an official at the Turkish Consulate in Damascus, acted on his behalf. The Syrian Government also stipulated the termination of Mevlevihanes in 1945. Currently the office of “Makam Chalabi” is held by Celaleddin Bakir Chalabi’s son, Faruk Hemdem Chalabi, merely with a spiritual and symbolic status. 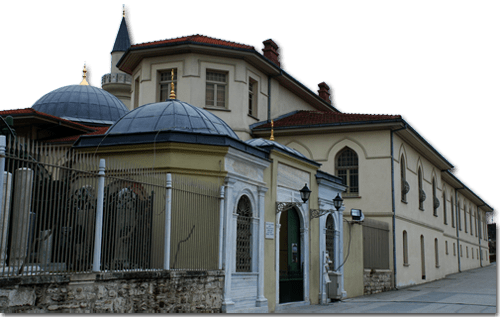 The first significant event regarding the “Mevlevihanes”, which had been shut down according to the relevant law (1925), was the reopening of the Mevlana Mausoleum to the public. It now held the status of a museum, as ordered by Ataturk, and was followed by the translation of the books of Mevlana into Turkish with the invaluable support of Hasan Ali Yucel, the Minister of Education of the time. Another significant aspect is the addition of the Mevlevi music concerts to the Seb-i Arus programs, which were launched after a conference held on September 17, 1943. The first part of the program in 1956 consisted of lectures of information and enlightenment and followed by a Sema performance in the second. During later years, a concert of mystic music was performed in the first half and Sema in the second. Hz. 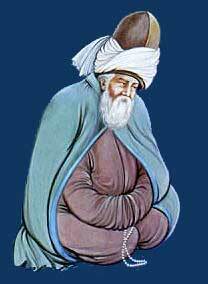 Mevlana Celaleddin-i Rumi, is known as Hz. Mevlana in the East and known as Rumi in the West. At birth, his family named him Muhammed, though he came to be nicknamed Celaleddin. As for “Mevlana”, it connotes to “our master”, while “Rumi” relates to “the land of Rum” or “Anatolia”, where he lived. In his lifetime, he was also referred to as “Hudavendigar”, meaning “distinguished leader”, whereas his present internationally renowned title “Mevlana” was very seldom used. The name “Rumi” was added to the end, rather later on. Hz. 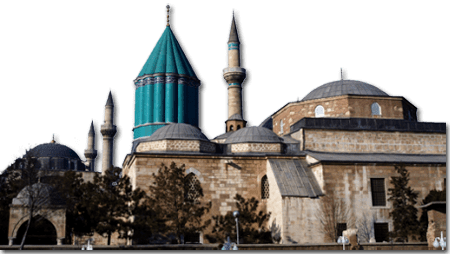 Mevlana was born on September 30, 1207 in the city of Belh, Horasan, which at the time was inhabited by Turkish tribes; (Belh, today, remains within the boundaries of Afghanistan). 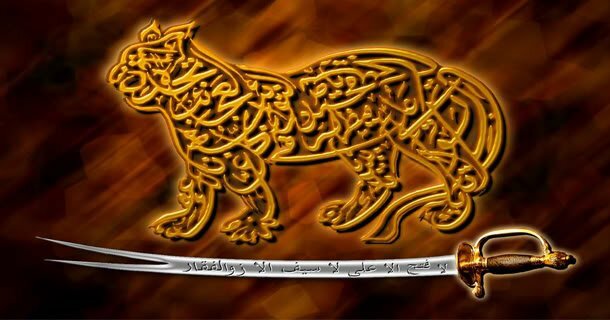 His mother Mümine was the daughter of Rükneddin, the “emir” (sovereign ruler) of Belh and his father, Bahaeddin Veled, was “Sultanu-l ulema”(chief scholar). Their clash of opinion with Fahreddin-i Razi, one of his contemporary philosophers, along with the probability of a Mongol invasion urged him to desert his hometown accompanied by his entire family. Their migration, via Baghdad, Mecca, Medina, Damascus, Malatya, Erzincan, and Karaman, ended up, on May 3, 1228, in Konya upon the invitation of Alaeddin Keykubad, the Seljuk Emperor. Following his marriage to Gevher Banu in Karaman, Konya, Hz. Mevlana had two sons whom he named Bahaeddin (Sultan Veled) and Alaeddin. Years later, during his time in Konya, and after Gevher Banu passed away, Mevlana married Kerra Hatun by whom he had two more children; another son, Muzafferreddin Emir Alim and a daughter Melike. As Mevlana begins attending his father’s lessons at a very early age, he pursues the divine truth and secrets. He acquires Turkish, Arabic, Persian, and common Greek as well as Classical Greek. He studies the other religions along with Islam. From history to medicine, he receives his initial education from his father and then from Seyyid Burhaneddin Tirmizi and other top scholars of the time. Later on he himself, in turn, teaches hundreds of students in Madrassahs (theological universities). Meanwhile, Sems-i Tebrizi, not fulfilled by the ultimate spiritual rank he has attained, is in search of another fellow acquaintance to match his own scholarly wisdom and to enjoy his company. Sems and Hz. Mevlana, who had their first encounter in Damascus, meet again in 1244, in Konya. These two God loving velis (guardians), focus intensely on divine discussions and together they attain heavenly wisdom. With most of his time spent in endless talks, poetry recitals, and whirling rituals with his spiritual soul mate, jealousy becomes aroused among Mevlana’s students. Unjust rumours are spread against Sems-i Tebrizi, who is offended and flees Konya for Damascus. Hz. Mevlana, in his deep grief, secludes himself from all friends and writes many of his verses which we read in Divan-i Kebir. The instigators of this unfavorable situation express remorse and a group led by Mevlana’s son Sultan Veled goes to Damascus and brings back Sems-i Tebrizi. Nevertheless, jealousy arises once again and Sems, this time, suddenly disappears altogether. Even though his tomb is assumed to be in Konya, whether he deserted the city or was murdered still remains a mystery. Hz. Mevlana enters a new stage in his life upon the disappearance of his close friend. He first appoints Sheikh Selahaddin-i Zerkub, who passes away, then he appoints Chalabi Hüsameddin, one of his own students, to teach on his behalf. Whoever carries a word of me apart from this I am complainant of him and I am complainant of those words too. it is telling a tale of separations. man and woman have moaned in (unison with) my lament. I consorted with the unhappy and with them that rejoice. none sought out my secrets from within me. but ear and eye lack the light (whereby it should be apprehended). whoso hath not this fire, may he be naught! ‘Tis the fire of Love that is in the reed, ‘tis the fervour of Love that is in the wine. its strains pierced our hearts. Who ever saw a poison and antidote like the reed? Who ever saw a sympathiser and a longing lover like the reed? The reed tells of the Way full of blood and recounts stories of the passion of Majnn. the tongue hath no customer save the ear. our days travel hand in hand with burning griefs. If our days are gone, let them go!– ‘tis no matter. Do Thou remain, for none is holy as Thou art! whoever is without daily bread finds the day long. therefore my words must be brief. Farewell! It connotes “What’s within is within” and contains Hz. Mevlana’s lectures. As the meaning of the title “Seven Sermons” implies, it contains Hz. Mevlana’s seven lectures. Be like ointment and candle, not a needle. And this is Hell itself . Abstract of my life are these words: Raw I was, Cooked well Burnt I got. Hz. Mevlana, who summed up life in the above words, passed away on December 17, 1273 following a brief time on his sickbed and reached out to his Allah and his beloved prophet. Mevlevi disciples call this night Seb-i Arus (wedding night), the night of unity. In the Mevlevi zhikr it is important that we are in harmony and unity. The goal is to be as one and that takes subtlety, nuance, and attention. To achieve this we need to follow the lead of the person leading the zhikrby being conscious of their volume, speed, and tone. We also need to be aware that our own voice does not rise above that of those who are near to us or the general level of the group. With practice and time this will create a more refined resonance in the group. When someone has been initiated into the Mevlevi Tariqah through the Threshold Society, it is recommended that they commit to performing this basic zhikr daily: Fatiha, 100 estaughfrullah (May God forgive me), 100 la illaha il Allah, 300 Allah, 11 Hu. The zhikr can be done audibly or silently. And there are various ways to do each: Listen to this talk, On the Mevlevi Zhikr, given at the 2010 London retreat and you will have a sense of how it is done. Jahri. The audible zhikr has more power to focus us when we are extremely distracted. It is also physically energizing. Appropriate and Inappropriate Names. It is not generally encouraged to experiment on one’s own with the Divine Names. Some of the Names are too powerful or destructive to be used without specific direction and protection. Yet, after several years of exposure to group practice under a teacher’s direction, one gradually becomes familiar with a repertoire of Divine Names that are appropriate. Pronunciation. Pronunciation of the Names of God requires some exposure to proper Arabic pronunciation. The “h” on the end of Allah is very important, as is the fact that there are two “l’s.” In Arabic there are consonants that we do not have in English, including certain t’s and d’s that are unlike our usual t and d. There are also three different h’s. Likewise there are vowels that are slightly different from our habitual English vowels. `Ali, for instance is pronounced like the word “alley,” not ah-lee. Adab, or spiritual courtesy, is fundamental to the whole Sufi Path. It is applicable both to our relationships within the Group and the Order, as well as in our relationship with a Shaikh. The principles and details can be studied in: Adab, also found in The Knowing Heart. Formulating an Intention. Making an intention and expressing it in a few clear words has a power. Completion. Acknowledging the completion of an intention develops will and prepares us for further stages of the journey. Preparing a Space. It would be best to have a place dedicated to our spiritual practice. Minimally, it should be a place where we can put a small prayer rug, or a simple sheepskin. A sitting pillow, or a meditation bench, will complete the setup. Consciousness of Time. We should endeavor to have a daily practice at a specific time. At least one half hour of inner practice is recommended. For most people, the morning hours are best. Additionally, there are the five times of prayer, which should be remembered: Fajr, between first light and actual sunrise; zuhr, just after noon; asr, mid-afternoon; maghreb, just after sunset; isha, anytime after complete darkness. Altogether, one hour of spiritual practice per day is recommended as the optimal or normative amount of time for spiritual practice. This might, for instance, include half an hour of contemplative practice or zhikr, as well as half an hour of the ritual prayer. Students who have not yet found value in the ritual prayer are encouraged to find another way to make the hour of practice, but the idea of punctuating the day with periods of remembrance and worship is essential to Sufi practice. Maintaining Presence. To state something very obvious, but which is nevertheless often forgotten: All the practices we do should be done with care and precision. Every practice, done mindfully, develops the power of Spirit within us. Using prayer beads (99 count) we can learn to be aware with each bead. Typically we may use one bead to mark either one or three repetitions of a Divine Name, or zhikr. If we notice that we have lost count, have been day-dreaming, or absorbed in some inner dialog, we start again at the beginning until we can complete ninety-nine beads. If this proves too difficult at first, reduce the number to thirty-three. The two most important inner locations are the heart and a point between the eyebrows. The heart is the point of maximum balance, the true center. When doing the zhikr of “Allah,” we should keep our attention focused on the heart. When reciting “la illaha il Allah,” with “Allah” the head is directed toward the heart, slightly to the left of the center of the chest. The brow point is a place where light can be concentrated. In meditation we may attempt to “see” through it, or bring light to it. Many kinds of experience are associated with this point: symbolic and imaginal vision, pulsing light, colors, intense white light. These two points are intimately connected and affect each other. In general, the aaah sounds are centered in the heart (love, deep centering), the eeee sounds in the brow point (knowledge, perception), and the uuuu sounds in the throat area (expression). As we do any spiritual practice we may receive suggestions, indications, inspirations. It is all right to briefly be aware of these and remember them later. Once someone has made a commitment to a particular Sufi path, they should avoid using any spiritual practices learned from other sources, in order to develop clarity of connection, loyalty, and depth of practice.